International Journal of Research in Health Sciences,2016,4,1,27-29. 1Professor and Head, 2Post Graduate, Department of Biochemistry, Chettinad Hospital and Research Institute, Rajiv Gandhi Salai, Kelambakkam, Kancheepuram District, Tamilnadu.603103, INDIA. Background: Glucose, the main metabolic fuel in our body is regulated by various factors inside and outside our body. These factors have become a leading cause in the development of diabetes in our society. One such hidden factor that most of us do not realise is sleep especially night sleep. Night sleep- is a state where most of the hormones in our body gets regulated. A good night sleep is required for maintenance of body’s circadian rhythm, this rhythm gets disrupted when night sleep is lost, like persons working in shifts, rotational shifts and on continuous night shifts. This changes the lifestyle patterns in individuals and slowly drifts into a society. Most of these night shift workers become a diabetic at a very early state and suffer from occupational stress induced non-communicable diseases. We designed this study to compare the fasting plasma glucose level in day and night workers. Materials and Methodology: This study included 80 subjects, 40 in both shifts and only males. Subjects suffering from diabetes, hypertension and chronic illness were excluded from this study. 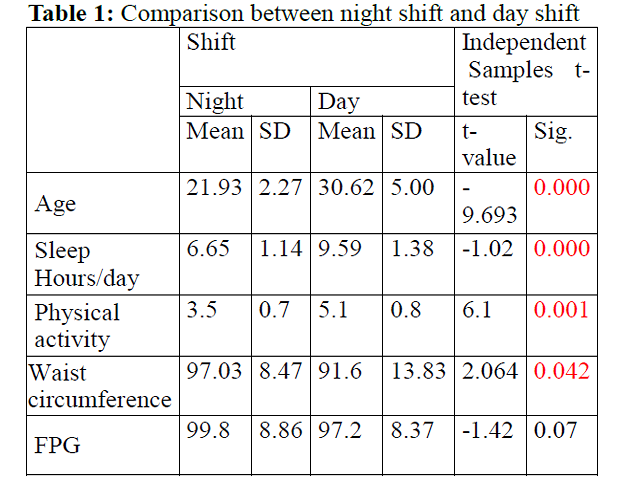 Results: The occurrence of impaired fasting glucose was found to be higher in night shift workers than in day shift workers.